One award at the FA Women’s Football Awards really captured my imagination; not only is the concept a brilliant one, I cannot for the life of me understand why it hasn’t been done before. The award was the #WeCanPlay Participation Award which went to the COGs (Crawley Town Old Girls) a football initiative aimed at over 30s who have never been given the opportunity to play football. 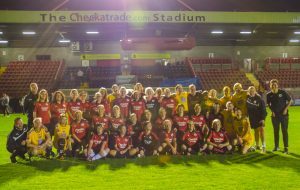 This all came about after the Crawley Town Community Foundation were given a grant by the Football League Trust to encourage female players between the ages of 14 and 25 with funding in place for a 10 week programme. The Chairwoman of the Supporters Alliance, Carol Bates, asked if the age limit could be extended since she for one would like to be involved and there are no opportunities for older women to play, the Football League Trust agreed to the removal of an upper age limit and an advert was placed inviting women to attend a training session. The first week ten women turned up, the second week there were 18 and 18 months later some 50 women are registered with an age range of 18 to 65, some have never played, some have played and given up, all are welcome. The women now pay weekly subs to cover costs and have bought their own kit. Such has been the interest in this innovative scheme that Sky Sports have made a short film, they will appear in a BBC programme in the New Year (Inside Out) and superstar and Vauxhall England Women’s Player of the Year, Arsenal and England’s Jordan Nobbs has made an appearance at a training session too. Earlier in the year it was decided to start a second group for beginners, which already has ten members. Some of the women attend both sessions, such is the enthusiasm. 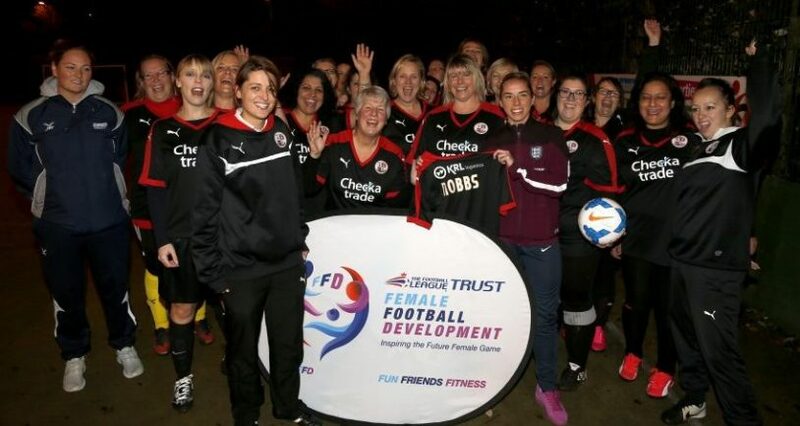 Amy Fazackerley, who works for the Crawley Town Foundation believes that they were lucky in having the right dynamic to get the group off to a flying start. The club gave them access to a pitch (which has since been upgraded to a 3G pitch), the funding in the beginning to pay for a coach and the enthusiasm from the players, particularly Carol Bates – who has (along with one of the other players) since gone on to do a Level I coaching course. Marcus Doyle who also works for the Foundation now coaches the women on a regular basis and he told me that in the beginning it was all about having some fun and perhaps getting a bit fitter whilst learning about football. However, he quickly realised that the women were capable of a lot more and the training, whilst retaining the fun element, stepped up a gear as they improved week on week. In the summer the group took part in the first ever Over 30s Ladies Tournament at Wembley and the FA People’s Cup. Gradually similar groups are springing up and last weekend they be played futsal against a ladies football team that has developed off the back of their daughters team called the Dorking All Stars. Support from within the Crawley Town FC has also been a great help. The hope is that this will take off and become as popular across the country as the men’s walking football. I will certainly be speaking to local football clubs to see what can be done up here, and will be doing all I can to promote this terrific initiative – Come on you Old Girls! I am 57 and so pleased that COGS was set up. The training sessions are the highlight of my week and I cannot wait to get there on a Thursday for the fun, laughter, training and the mini football match at the end of each session. I am so much fitter than I was last year and absolutely love it. Come on ladies it is such a fun way of getting fitter without realising it. I am loving my football and Marcus, our coach, has even given me a nickname. I am the Rock in the defence. Thursday night with my fellow COGS is the absolute highlight of my hectic work week. It’s the only time that I get to myself and totally switch on from work. Not only do we have fun but now have developed some great footballing skills to play competitive sports! As a parent for which have stood at the side lines watching my daughter play for the last 12 years I now get the chance to play and at most sessions together in fact, the mum and daughter duo! We have a fantastic coach for whom without we would not be at the level we are today.